Reason for Reading: Titanic Week read. April 14, 2012, marks the 100th anniversary of the sinking of the Titanic. The “unsinkable subject,” the story of the giant ship that sank on its maiden voyage, has become one of our most potent modern parables and enduring metaphors. The image of the ship’s plunging stern is an icon, and expressions like “rearranging the deck chairs” and “hitting the iceberg” need no explanation. I have always been interested in books about the Titanic, so I was very excited to read a few of the new books out in honour of the centennial. I will probably never be able to read all of them, but I want to read some of them. You would think there would be only so much that could be said on the subject, but since there were so many unknowns that evening there are a lot of theories. For example, despite some people saying the boat broke in half when it went down, it wasn't until the ship was found in 1985 in two pieces that this became the popular opinion. This means that for 73 years the popular opinion was that the ship went down in one piece. The thing with the Titanic is there are common events that cannot be ignored, but each book can choose an entirely different way of looking at things. Hugh Brewster's book is one of the new releases for 2012. I was offered a chance to read it from Harper Collins Canada, and I knew I had to take the opportunity. I was curious about his method of telling the story. He chose to write it from the viewpoint of mostly the first class passengers, but he talked about some that I have never seen a lot of attention paid to before. It made for really interesting reading. Plus, for a non-fiction book it read like a novel and that is always a plus. I like how he just tells their stories, but makes he clear when he is only educationally guessing what they were doing at certain times based on other evidence or just the routine of the person. This way it is like he is telling a story with the beginning, middle, and end. And, he writes believable. We will never know for sure exactly how every event played out, but he does a very good job of hypothesizing. It makes people that have been dead for years come alive for the reader. I think with the Titanic it is easy to get caught up in the facts and miss that these were real people with real stories. I really appreciate a book that reminds us of this. At the end of the book there are brief biographies on the survivors that he mentions in the book to say what they did with the rest of their life. There is also an extensive note section and bibliography that I have been browsing. The thing that my ARC lacks is the pictures. As there is a note at the back that says there will be Photo Credits; this makes me think the pictures that he talks about throughout the book are probably included in the finished copy. I know I will be buying a copy at some point to see. I want to concentrate on books I haven't all ready read first, or I would have probably bought it right away. I always like looking at the pictures. 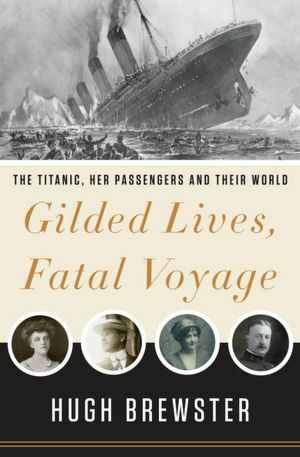 I think this book does a great job of looking at the passengers of the Titanic. Strongly recommended! Thanks to Harper Collins Canada for my copy of this book. I know... I think for the third class it is partly because so little is known about them and there is discrepancies about who was actually on the ship. I am not sure why they don't talk about 2nd class, though. I will definately need to add this to my books to get at the library. It was really quite good! You could tell he did his research. I hope you enjoy! I'll have to add this to my TBR. I'm kind of obsessed with the Titanic. My friends don't understand why I am compelled to read every Titanic book that comes along, and I'm not sure I do either, but I think that maybe I'm hoping for a different ending if I read enough books! I think that sounds like an interesting book. I like the fact that you say it covers some of the people you don't see mentioned all the time. I'm adding this to my Titanic list!